TL; DR: With more than 1 million new malware threats being released each day, it’s a dangerous world out there for the SysAdmins trying to maintain a secure network. Regardless of size, all businesses need effective solutions to protect their data from breaches. Thankfully, GFI Software provides enterprise-grade security software at a price point accessible for SMBs. Two of the company’s leading solutions, GFI OneGuard and GFI OneConnect offer a centralized platform from which to manage systems security and improve infrastructure availability. With software built around functionality, ease of use, and quality, it’s easy to see why so many SMBs are turning to GFI to help mitigate threats and streamline network security. Adapting to vulnerabilities is one of the most important aspects of network security. CNN estimates a massive 1 million new viruses are released every day. With new threats rising at such an alarming rate, well-prepared network technicians should have the best security software at their disposal — no matter the size of the companies for which they’re working. All of today’s businesses need enterprise-level tools to protect customer and proprietary data; however, many of these tools have historically proven cost prohibitive for most SMBs. Fortunately, GFI Software provides enterprise-grade security solutions with price points for any size business. GFI’s software covers a broad range of security needs to address the largest possible user base. With the help of GFI OneGuard and GFI OneConnect, businesses find an easy-to-use, functional, and top-tier means to secure networks. GFI’s flagship product, OneGuard, offers a platform to manage network security from one centralized location. The software provides real-time antivirus protection, patch management, and asset tracking to keep tabs on network resources. Paired with GFI’s cloud-based email management platform, OneConnect, which includes email archiving, spam and malware protection, and continuity services, businesses have a complete toolbox to guard against breaches in the ever-evolving threat matrix. Security is essential not only when downloading files from a server, but also when sharing files among peers. Someone may unknowingly download a virus or have an undetected RAT or botnet that attaches itself to an unsecured file. Ian noted IT teams are looking for comprehensive security solutions that can be easily housed and managed under one roof. And that’s exactly what OneGuard and OneConnect offer. GFI OneGuard is an IT management software with antivirus functionality. Because OneGuard provides centralized control, IT managers can more easily monitor networks as opposed to decentralized configurations. 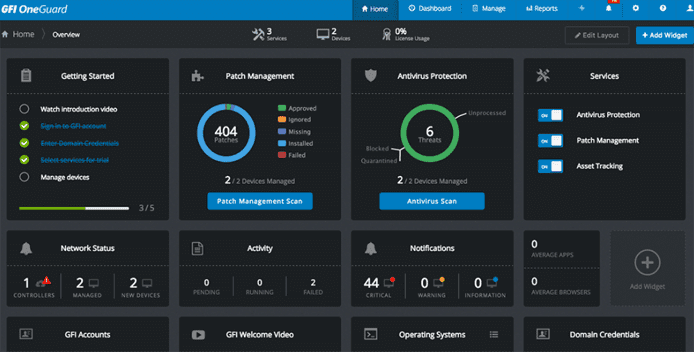 OneGuard’s intuitive user interface offers a centralized location for network, patch, and antivirus management. 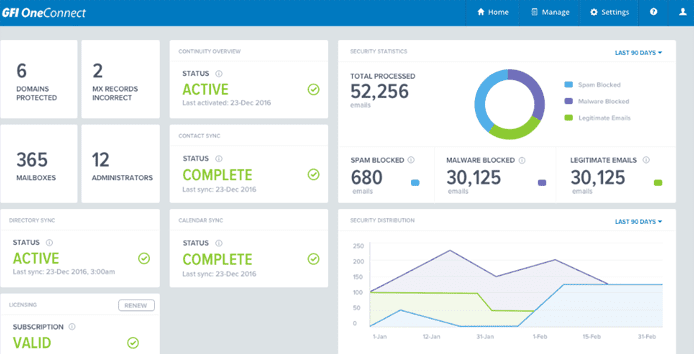 OneGuard’s features include real-time antivirus scans powered by Kaspersky, resource tracking, and patch management. In the case of an emergency, systems may even be rebooted or shutdown remotely. Threat assessment, as well as file and device sharing, thus becomes quicker because scans and patch updates are applied as soon as they get released. “It is basically one platform to control your servers and devices and to make sure they are secure using different services,” Ian said. OneConnect is similar to OneGuard in that it protects users from malware. Whereas OneGuard revolved around general network security, OneConnect concerns itself mainly with the email and communication aspects of networks. GFI OneConnect offers advanced spam and malware filtering to protect networks from email-originated threats. Unfortunately, many inbound threats come in the form of suspicious email attachments and dubious phishing messages. OneConnect’s approach to spam filtering is multifaceted, featuring Sender Profile Framework (SPF) and Bayesian analysis to detect spam preemptively. OneConnect also keeps an archive of all emails and will step in for an Exchange server in the event of unexpected downtime. Both OneGuard and OneConnect help network technicians keep their systems safe from threats before they even show up. Reliable software should work properly, be relatively user-friendly, and be cost-effective. Since GFI bases its software on these principles, the company has become one of the top names in centralized network security. GFI offers an all-in-one approach as opposed to companies having to cherry pick through multiple providers and partners to find the solutions they require. GFI’s software was developed with the aim of offering enterprise-grade security solutions to SMBs. These benefits are achieved through GFI’s dedication to three main pillars of excellence — functionality, ease of use, and quality. 1. Functionality: As Ian noted, it has been difficult for small- and medium-sized businesses to get a foot in the door when it comes to adopting all the security precautions required in today’s online landscape. The threats are the same whatever size business one is running, so it’s imperative SMBs find a cost-effective solution with feature functionalities adapted to the modern world. This functionality includes the array of features offered by OneGuard and OneConnect, including email backups, centralized cloud monitoring, and real-time virus scans. 2. Ease of use: The friendlier the UI, the easier it is for projects to see completion. Ease of use is also achieved with automation, and GFI’s scans run automatically to detect vulnerabilities before they can be exploited. Because IT professionals often spend long days at the office working on numerous projects, they need software solutions they can learn to use quickly and without hassle. GFI is dedicated to adapting to the ever-changing software market. Because security needs are always in flux, good security software must follow the trends. GFI is committed to helping IT departments become more secure and manageable through its security and archiving software. In many ways, the company is doing this through the acquisition of new technologies. Ian noted that the company’s latest 2017 acquisition of Kerio Technologies, with software responsible for security in connecting and collaborating, is a wonderful fit with the GFI portfolio.